A native bumble bee (photo Sheila Colla). I’ve been researching pollinator declines over the past decade. It has been encouraging and inspiring to see my chosen subject matter go from completely off the general public’s radar to one of the most important environmental issues of our time. These days, it would be difficult to go a full week without seeing something alarming about pollinator declines in a newspaper or social media headline. In general, it is great that the public and policy makers are starting to appreciate the insect pollinators and the ecosystem service they provide. Heck, even Obama himself wants to help! These little creatures feed on nectar and pollen and move pollen grains from flower to flower while foraging. This behaviour allows gene flow to occur among plants, which then leads to the production of seeds and fruit. Given the estimates that over 3/4 of flowering plant species rely or benefit from pollination services, these oft-neglected insects are critical components to maintaining ecosystem and agricultural sustainability. Public support for bee-saving initiatives has been overwhelming. People are constantly looking for ways they can help declining bee populations. 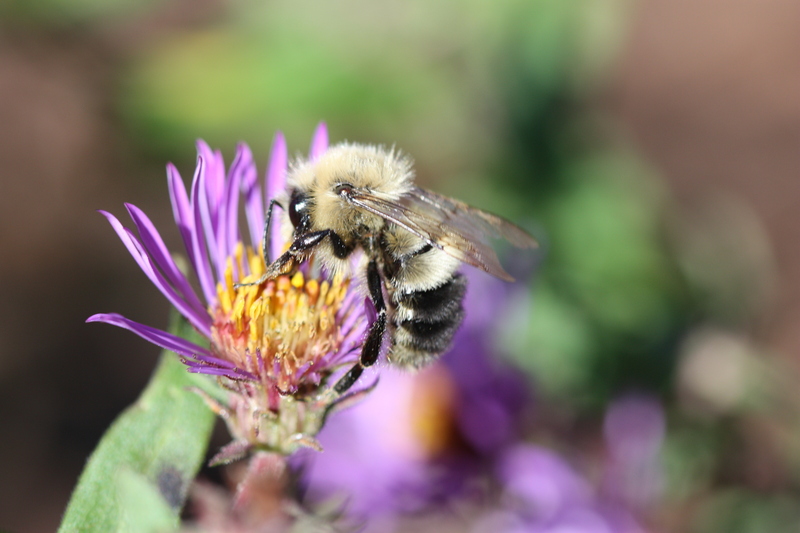 For example, a record-breaking 50,000 Ontarians recently commented on a proposed pollinator policy, the large majority in support of their government’s plans. And the Indiegogo project, “Flow Hive,” which proposes a gentler way to extract honey that’s easier on beekeepers and bees, has already raised $6 million US (more on this later). However, as a biologist actively working on this issue from a scientific, data-driven, and wildlife conservation perspective, it is increasingly apparent to me that rampant misinformation on a popular topic is leading to misplaced support. One of the key issues is that when people think of bees, they think of the European Honey Bee. But increasing scientific evidence indicates that our hundreds of native bee species are likely doing much of the pollination attributed to honey bees (see here, here and here for a few examples). And our native pollinators (including some bees and butterflies) are also in decline. The causes of their declines are complex and include a combination of environmental stressors such as habitat loss, pesticide use, introduced competitors, climate change, and pathogen spillover from managed bees. There is no single smoking gun. While the European Honey Bee does produce honey and is useful in that we can move colonies from crop to crop across the continent to where pollination is needed, it is not native to North America. Correct me if I’m wrong, but when European Honey Bees decline in Canada, beekeepers can order more! (I understand that there would be a monetary cost to this, but I’m taking the perspective of a wildlife biologist, not a business owner.) This is not the case with our native pollinators, particularly those on the brink of extinction. Once they are gone, they are gone forever. And there could be cascading effects on plant populations, which require them for pollination, and on birds and mammals, which rely on the resulting seeds and fruit. Directing resources and policy to one introduced species might actually have the opposite of the intended “conservation” effect. Case in point, remember the $6 million dollars donated to the “‘Flow Hive”’ initiative? Well it turns out that those bees are stressed by having their honeycombs ripped open and by making it easier for the urban beekeeper, we could be ramping up introductions of non-native bees and their diseases (some known to be transferrable to native pollinators). In the end, this and other ‘Save the Bees’ initiatives could have significant negative impacts on native pollinator populations. A recent scientific paper by one of my Packer lab siblings, Scott MacIvor, shows that even bee condos (which are sold widely to support wild bee populations) are not having the desired effect and require further study before we can promote them as a conservation tool. Going forward, I encourage you all to redirect this growing enthusiasm and love for bees to include native pollinators and their diverse threats. If you’d like to help wild bee populations, join citizen science programs (such as www.bumblebeewatch.org), encourage your governments to work with scientists to develop policy, and create/preserve native habitat wherever you can. Be wary of single issues, which claim to be the sole threat to bees, and items for purchase, which claim to solve the problem. We are dealing with a complicated issue and are actively trying to gather the data required to move forward. vulnerable native pollinators is the right way to truly ‘Save the Bees’, in my (expert) opinion.